Today was work day at Ellen’s. 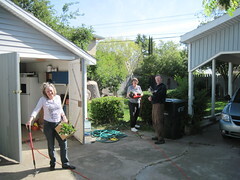 Jack and I did some fence, gutter and lawn mower repair while Esther and Susan did some landscape beautification. Ellen kept a Bulthuis tradition alive by bringing home a Friday night Papa Murphy’s pizza. We had an enjoyable evening as siblings reminiscing and sharing dreams.